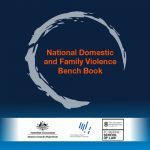 The purpose of this bench book is to provide a central resource for judicial officers considering legal issues relevant to domestic and family violence related cases that will contribute to harmonising the treatment of these cases across jurisdictions along broad principles and may assist them with decision-making and judgment writing. This bench book does not seek to represent the opinions or preferences of judicial officers, or to direct judicial officers as to the manner in which they should respond to domestic and family violence related cases. Rather, it provides background information and knowledge supported by research, links to a range of legal and related resources, and practical guidelines for courtroom management that judicial officers may consult when considering the breadth of issues and appropriate course of action in any individual case. In deciding whether, or how, a particular issue may be dealt with, the judicial officer must necessarily balance the interests of all participants in a case.